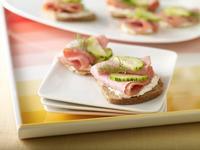 Cut each slice of turkey ham into quarters; set aside. Spread bread pieces with cream cheese. Fold turkey quarters in half. Place turkey on cream cheese. Top each piece with cucumber slice and garnish with fresh dill, if desired.